Snap has officially launched is next generation Spectacles and while they look near identical to the first version, there are some new features it hopes will convince more people to buy them this time. Now available in ruby, onyx and sapphire models - each with two lens color variations - the new camera-toting specs will now let you take photos as well as record video. The recording resolution has been given a bump up going from 1088 x 1088 to 1216 x 1216 at 60fps. You can also snap 1642 x 1642 resolution pics. There's 4GB of storage on board letting you store up to 150 videos or 3,000 photos. That's right, photos. While the original Spectacles only did video, the new Specs add photos. You'll just have to hold down on the camera button to take a photo. There's also an extra microphone to improve sound quality in your Snap vids. Beach-goers will finally see some utility for the Specs as they now feature a water resistant design that, according to Snap, will let you use them in the rain or in shallow water. The design is slimmer as well, as the area where the camera and LED array is positioned just above the lenses have slimmed down about a third. It's still a one-size-fits-all model and the Wi-Fi and Bluetooth-packing shades are compatible with both iPhone 5 and above and Android phones running on Android 4.4 or later. Battery life is a week of regular use and Snap's website says it'll manage up to record 70 videos on a single charge. Like the glasses themselves, the charging case has also gotten slimmer - 20% to be exact. A couple of features stay the same - so you can still only share videos to your Snapchat Memories and then later you can export them out of the app. However, that process has been streamlined from the original pair. Snap says transfer speed is four times faster, and that the average transfer speed for a 10-second video has gone from 9 seconds to 3 seconds. When you're home, the Specs will automatically transfer your videos and pics to your Snapchat account when you're on Wi-Fi. Transferring photos and video still isn't perfect though, and it would be nice if the Spectacles constantly uploaded your stuff to Snapchat without you having to worry about it. Plus the filters, stickers and drawings can only be added once you're done, not in real time. What's going to keep these from being a write-off? Snap says it some planning mistakes with the original pair and has made corrections. Instead of selling them in the viral Snapbot vending machines, it'll only be selling them online at Spectacles.com. The company says this will allow it to track demand, which in turn will allow them to not get too excited and make too many. In terms of price, you can pick up a pair now for $149.99, which makes them $20 more than the first Specs. 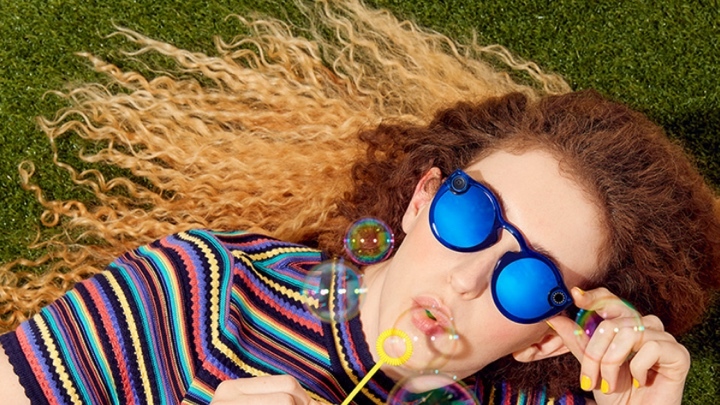 It's fair to say this is one wearable we didn't expect to be resurrected, especially when Snap said it didn't plan to "annualize" the failed glasses and that first batch was deemed a failure, leaving the company with hundreds of thousands of Specs laying around a warehouse and a $40 million write down. Recent reports suggest there's more glasses to come as well with the company planning a more ambitious third pair in 2019. Next year's model is reportedly more ambitious, coming with a brand new design that's reminiscent of the round-framed glasses a lot of Snapchat face filters use. That pair would also come with two cameras, which would be used to add a 3D depth effect to video taken with Spectacles. You can see an artist's rendering of what they look like above. Snap is also in talks with eyewear companies Luxottica and Warby Parker, offering its cameras to them to put in their own pairs of glasses. This lines up with what Matt Miesnieks, managing partner at Super Ventures, told us last year: the company is looking at partnerships to extend its reach in the hardware space. Spiegel sees augmented reality as the next big computing platform, and he wants Snap properly placed to ride that wave with smartglasses. Snap's AR efforts are believed to still be a couple years down the road, but it does have patents for glasses with two cameras that can learn a user's position. Connecting the dots, you can see how it's laying down the foundation for AR glasses in incremental steps. CEO Evan Spiegel believes AR smartglasses to be an important part of the company's future, so it's going to keep trying until it gets it right. If you're interested in the latest pair of Snap Specs, you can buy them now from the Snap website. No news on whether those vending machines will be making an appearance again, but we wouldn't be all that surprised if Snap had something similar up its sleeve to draw some attention to its second generation camera-toting shades. "Leaving the company with 90,000 pairs laying around"
You're linking to an article explaining that they sold 90.000 pairs within a short period after general release?!? Thanks for pointing that out, we've fixed it to reflect the "hundreds of thousands" of Specs laying around the warehouse story instead.